BB or blemish balm creams (and not beauty balms as some brands have called it) are the hottest beauty product in Asia that have started to make their way into the mainstream western market and seem to be taken the cosmetic world by storm. BB creams shouldn't be confused with tinted moisturisers as their primary function is a makeup, not a skincare product and the coverage from BB creams are fuller than the sheer colour that tinted moisturisers provide. The concept is that blemish balms are a combination of skincare and makeup, made to even out skintone and give excellent coverage so is suitable for all skin types, even those with acne or problem skin but without the heavy mask-like effect of heavy foundations and also has skincare ingredients that will improve skin's tone and texture over time. there is generally only 1 or 2 shade available for the product and they generally gravitates towards the lighter end of the spectrum (the Asian consumers like their faces as white as possible, even if it means it's significantly different than their natural skintone whereas I prefer a natural looking shade). the ones I've tried have made my skin look grey and ashy and generally quite ghastly-looking which disheartened me to try the other BB creams for a good 2 years. It was upon the ravings of the MBBE ladies about the Skinfood Mushroom BB cream and how it would not look ghastly grey on skin that I decided to give BB creams another try. And of course I can never go wrong with the advice of MBBE because even with my limited experience in BB creams, I know a gem when I come across one. Hailing from Korea, Skinfood is a brand that has a huge following outside of its home country within the east Asian region and appeals to consumers with its use of natural food and produce in its original form as ingredients in its products. This triple-function BB cream provides UV protection and deep moisturisation to skin with aloe and mushroom extracts, while arbutin and adenosine make skin clear and resilient. 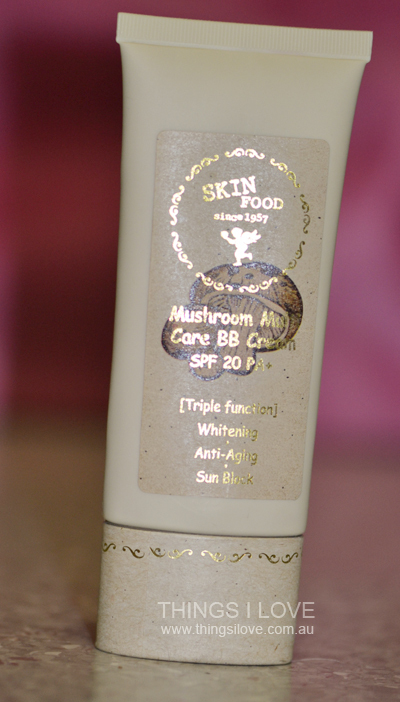 The Mushroom BB cream come in an easy to dispense 50ml tube and a cardboard screw cap. I'm not a fan of the cap as I find it hard to twist it along its groove after use, but have not had the cardboard warp or break on me so I guess I can live with it. It comes in 2 shades 1 or 2 as indicated on the back of the tube packaging in the brown circle. I knew I would be #2 from previous experiences of going for the darker shade whenever there are 2 options as it's more natural looking on me (incidentally shade #1 is called radiant skin and #2 is natural skin). As for the product, it is quite fluid, almost like a moisturiser in consistency but is very easy to blend. It has a soft scent. Using a brush gives a good blended finish but it does not really meld into the skin to give the fused look that one wants from their makeup (ie. not heavier sitting on top of skin). Interestingly, it spreads and blends best with finger in a smearing action outwards from the centre of the face, then blending the product on the nose, jawline and the forehead. The finish a soft dewy look that makes skin look and feel very hydrated (thanks to the aloe). And because it feels so comforatble on skin, I don't feel bad on days when I'm in a rush and skip my skincare treatments and just apply this straight on. Coverage is excellent and almost as good a full coverage foundation with imperfections and dark circles easily covered and concealed. Extra coverage just needed another layer of the product patted into the specific area of skin. I finish by setting with loose translucent powder and the coverage lasts all day, even in hot humid weather. Shade #2 is very natural looking, and although slightly lighter than my summer skintone, adjusts well on skin and does not leave me looking too pale or washed out. Rather, I have a fresh healthy subtle glow (non-shimmer induced) and there is no white cast effect from the SPF 20 to be found. 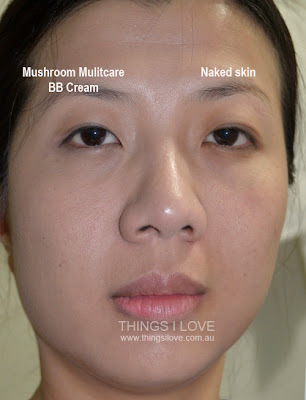 This BB creams photographs amazingly well as seen in the photo below (please excuse my bare face with no eye makeup or other products on at all). My dark circles are not present, skin evened out and smoother with a slight dewiness on the side where I've applied the BB cream. You can also see that it is also slightly lighter my my natural skintone but is still very natural looking. I like the fact that I'm also helping to maintain my skin whilst applying this makeup and my skin always feel soft and smooth after taking off the product and facial cleansing afterwards. So thanks to my gurus at MBBE, I've finally found my first favourite and possibly HG BB cream. Having said that, BB creams are not for everyone - due to the fact that if you are NC/NW30 or above, you will look unnaturally pale using these products without a bronzer to bring colour back to your face. 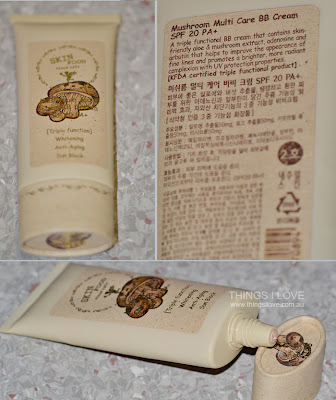 If you are lucky enough to be able to use the this or the lighter shade (which would suits NW/NC15-25), then you would be nuts not to try this BB cream. 50ml approx US$13 online by e-tailers. If you are after convenience and instant gratification, you can pick it up locally at Asian beauty boutiques for A$29. I'm considering buying this, I currently have the Skin Food Aloe Sun BB Cream and I love it but I'm really interested in getting this one too!